For the past three months, we have lived a few minutes walk from the beach in a quiet village in Bali. I can’t quite describe how simple life is here, and how luxurious that feels. We awake with the early dawn light, and try to “sand-ify” our feet before the sun is high as it gets hot here in the tropics, quickly. We say hello to the beach dogs, our son falls in love with yet another puppy and I collect shells that we scatter around our house as reminders of the ocean’s beauty. 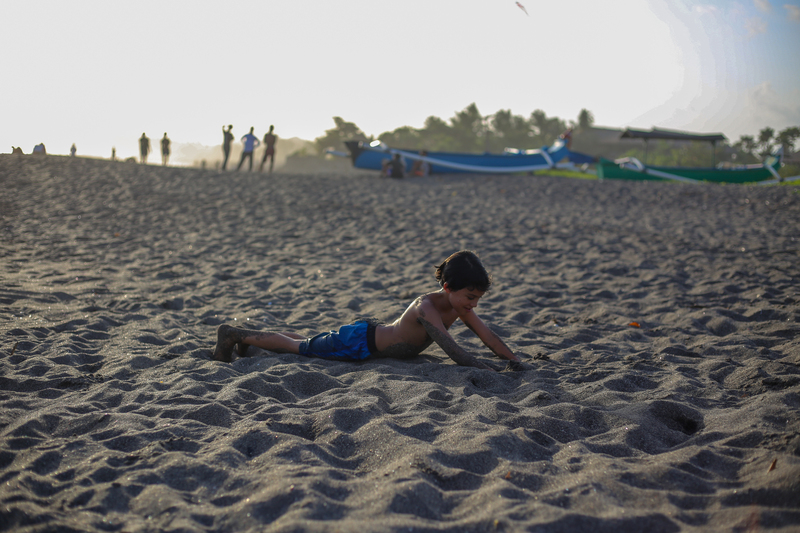 We track sand in, sometimes even onto our beds and walk barefoot as much as possible. We watch the ocean as it changes. There are days when the wind is still and the water is “glassy,” others when the waves carouse madly with storm swells. 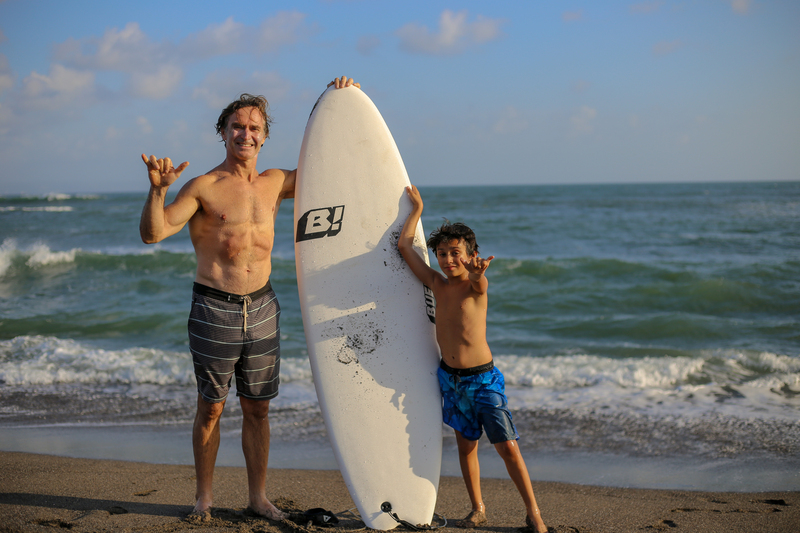 We play in the surf, we play on the sand and we push our 7 year old into waves that he now finds comfortable and we give thanks to the ocean for offering us so much. Today is World Ocean’s Day. Whether you live by the ocean or not, it’s a good day to tune into the ocean and her needs. 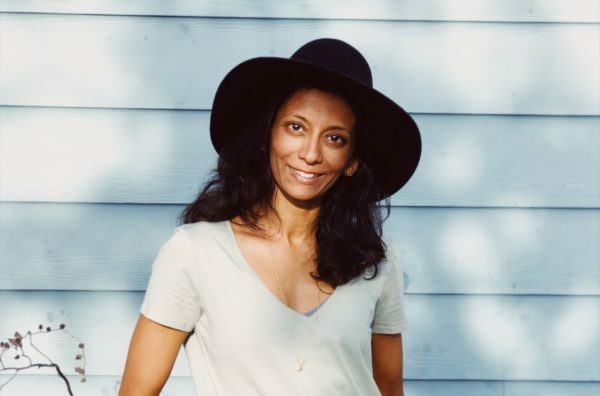 Whether you’ve been lucky to live by unpolluted waters, or experienced first hand what happens to a city by a bay that leaks its waste into its estuaries and sea – I grew up in Bombay, India, where the sea is the collective exhale for the city’s population of millions, and it is also sadly the sewage dump for so much of its waste! To me and to my partner Eoin Finn @blissology; caring for our oceans is an extension of our YOGA. It is about taking our practice off our mat and offering its benefits to help our world with purpose and compassion and LOVE. 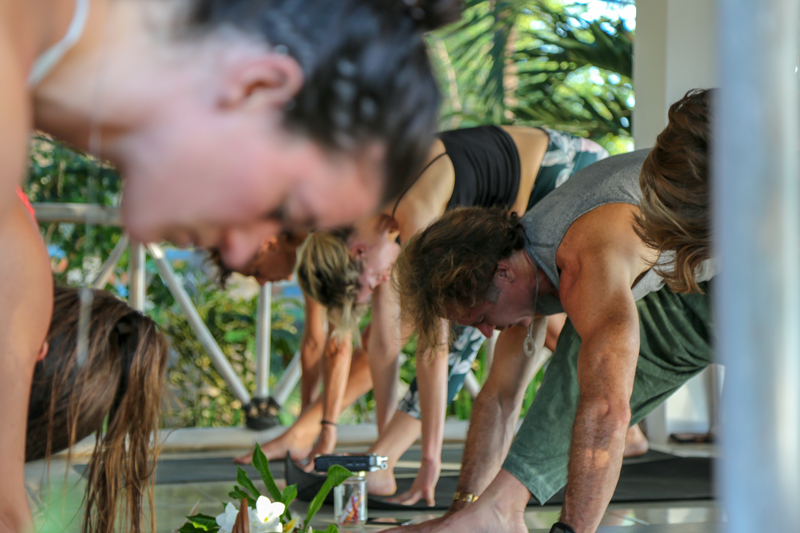 We call it Eco Karma and each year we offer the opportunity of this Karma Yoga as part of our Bali Yoga Teacher Training course. 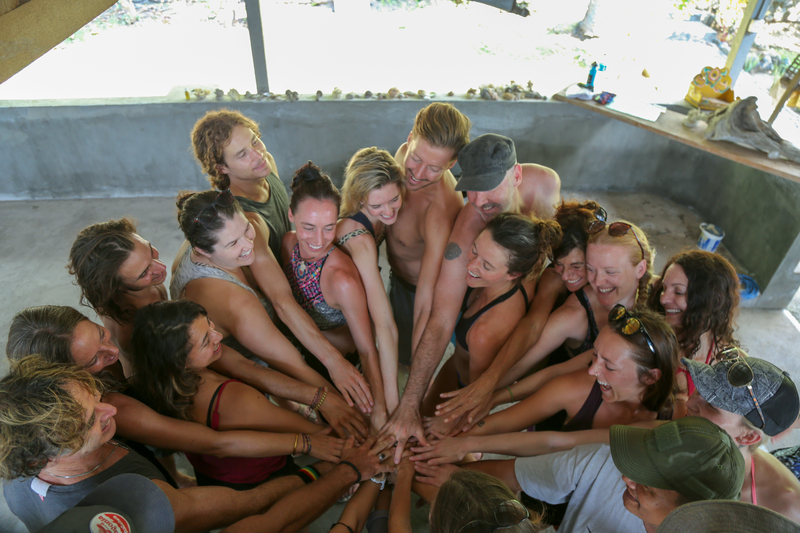 This year, once again we journeyed to northern Bali with a crew of our amazing students and the inspiring Phil Dickenson of Yoga for Nature, who came along to document the journey. 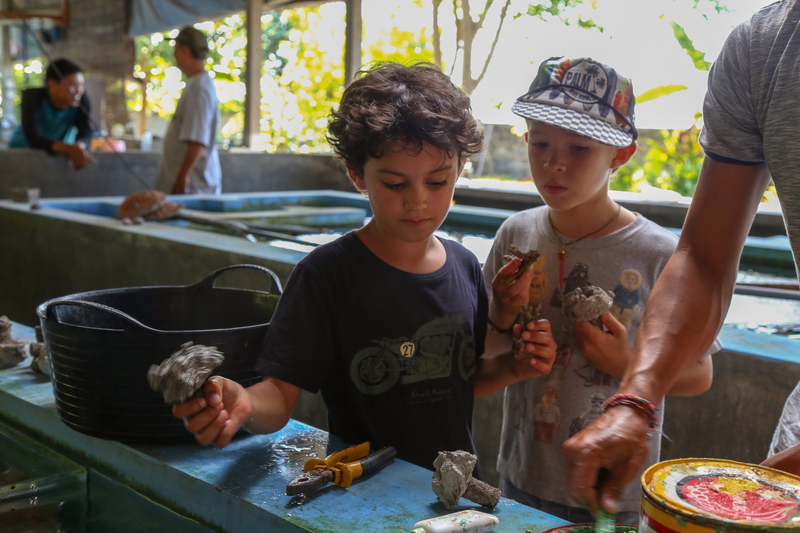 We volunteered at innovative non-profit LINI, which helps to restore coral and promote sustainable aqua culture in the Balinese communities. We took our son and some of his friends along so the next generation could also participate. We transplanted coral, practiced yoga by the ocean, meditated on a beach after we first picked up trash. Our days were full of hope and love. We returned charged up with the zeal that emerges when you realize that our collective actions can make a difference. Here are some current stats on the health of the ocean and some simple, impactful things we can all do no matter where we live, to help protect our ocean mother. The world’s oceans are becoming more acidic, threatening sea life. Why? Because the oceans absorb more CO2 from the atmosphere, negatively impacting the healthy propagation of coral reefs. The Coral Reefs are like the rain forests of the ocean. They cover a mere 1% of the ocean floor yet astoundingly they are home to approximately 25% of all marine life! Today coral reefs around the world are in danger. Some estimates show how approximately 10% of the world’s coral reefs are dead and about 60% of the world’s reefs are at risk due to human-related activities. By the 2030s, 90% of reefs are expected to be at risk from both human activities and climate change. To learn more, watch “Chasing Coral” (link below) and join our next Eco Karma program. Our oceans are getting warmer: This is a FACT, no matter what the current US government says! Warmer oceans put coastal communities at risk, increase infrastructure costs, endanger polar creatures and threaten coral reefs and fisheries. Perhaps most alarmingly, rising ocean temperatures accelerate the overall warming trend. Plastic is killing ocean animals and swirling in our oceans at unprecedented rates. At current rates of plastic entering our ocean, we will have more plastic than fish by weight in the year 2050. Watch “A Plastic Ocean” a heart-wrenching documentary for more on this topic. It will change your life. Go PLASTIC FREE. I cannot emphasize this enough. Specifically. Give up single use plastic consumption. This means, no plastic water bottles- say no to free, promotional ones – zip lock baggies and plastics that you use in your life. Switch to cloth bags, beeswax wrap, reusable bags and glass or stainless steel water bottles. Pick up 3 pieces of trash at least every day. Check out this non-profit to learn about the impact of this action. Use reef-safe sunscreen. Hawaii finally banned toxic sunscreen this year as they want to protect their coral reefs. We love raw elements. Look for “reef safe” on your sunscreen brand this summer. Use eco-soap for your dishwasher, car, and home. I know you don’t want toxic chemicals on your body, on your dishes or on your clothes, but have you ever thought that much of the run-off from car washes goes directly into the ocean? Buy and Use a reusable coffee/or tea mug. Our Eco Karma KEEP Cups are an amazing option. I love their beautiful design – you won’t want to lose them. Plus proceeds from these cups go towards our coral restoration work. Since June 2009 eight million KeepCups have sold and users have diverted billions of disposable cups from landfill. In the same time approximately 5 trillion disposable cups have been made and discarded to landfill. My other suggestion, instead of taking your coffee or tea as a to-go option, sit down, make the time to enjoy it and ask yourself why you are in such a rush! Because I want to leave a sustainable planet for the next generation and the generations to come. Because I know that even while the degradation of the planet is occurring at a quickening rate, when we shift our behaviors, even small behaviors, they do collectively add up. And it is not too LATE to begin right away. We have seen coral reefs regenerate, we have witnessed communities transformed by sustainable aquaculture practices and we have experienced more happiness knowing that we can make a difference. I hope that this list of suggestions inspires you to shift a few habits now. At the end of this post you can watch a special treat, a short video of our Eco Karma journey as well as a list of inspiring links where you can learn more about what is going on in our oceans. Thank you for reading. Sending you much ALOHA, NAMASTE and HOPE today and every day. PS. 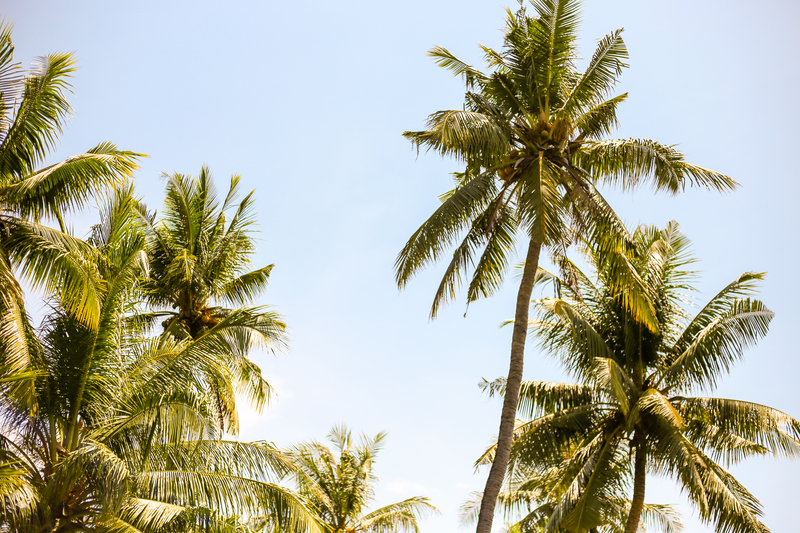 here is the amazing VIDEO via @blissology from our EcoKarma Journey this May in Bali. Thank you beauty <3 Can't wait to share this with people!! Thanks for sharing!!! Much love and aloha.